New beginnings and promising horizons are in the forefront of my mind (my last post was about it). I have reason for them to be. We have several "new beginnings" happening around here. Hence, a new installment, Chapter 13, in the story of how Rosehaven Cottage came to be. And this time we're living through it as I write it. Every year since 2000, when the winter rains come we've braced ourselves. We knew we were moving into the southernmost part of the rainy region of the "North Bay" and it's notoriety for deluge rain in the winter. What we hadn't anticipated when we bought this home was that our southern property line is, in fact, the lowest point on a long keyhole court with water draining downhill toward us from both directions. That's right... uphill to either side of us. 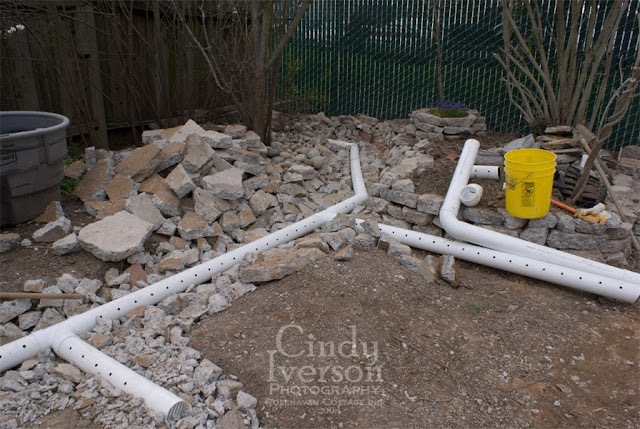 We soon realized why, during the first year of digging in the back garden, I kept finding completely buried brick walls that had once been part of a terrace system throughout the whole backyard. The water would run with such velocity diagonally across the yard that the 2-3 foot high brick walls were eventually buried in runoff silt, mud and dirt. So over the course of time since our first winter in 2000-2001, we have installed a cleverly disguised drainage system throughout the back garden so the water is moved away from the house and under the garden instead of through it. From February 2008: in the midst of installing the drainage system in the back garden. The last piece of this difficult drainage puzzle has been in front of the house. Our driveway slopes downhill away from the street and toward the house. If the storm drain a few inches from the edge of our driveway is clogged with leaves and debris (as it was last Easter Sunday), water diverts down the driveway straight toward our garage. 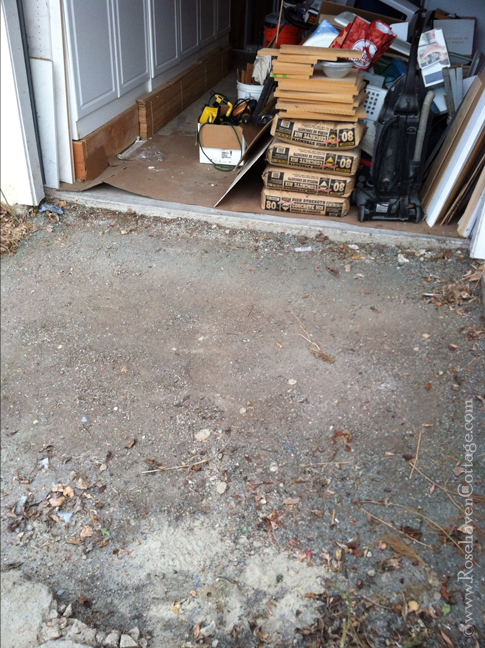 In 2005, after I had a strong intuitive feeling that we needed to do so, Hubby and my brother jackhammered out the 8'x8' section of driveway right in front of the garage door. They thought I was nuts to insist upon it... that is until 2 months later we had torrential rain that flooded many homes and garages in our town. Ours would have been one of them and we would have lost over a $1000 in building materials being stored there for the other restoration we were doing at the time. 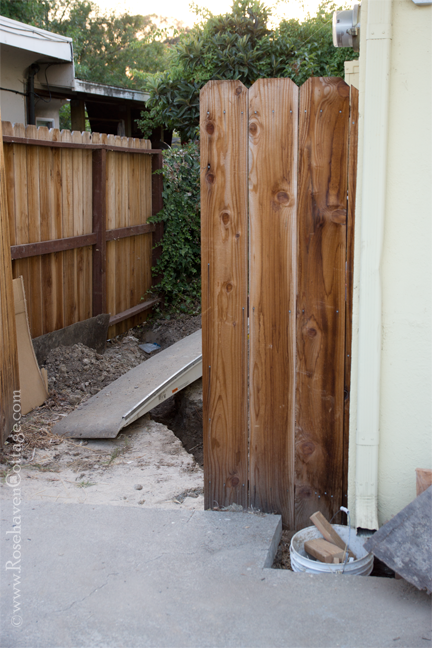 Since 2005, we have had to live with an embarrasing gaping hole in our driveway. 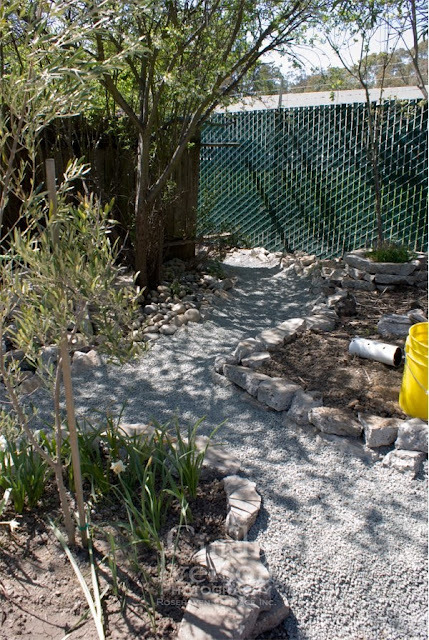 First, we filled it with pea gravel and then realized that wasn't the best solution because the neighborhood cats thought it was a giant litter box. Then we moved the pea gravel and used it elsewhere (I always have a purpose for pea gravel in our garden). It remained an empty "pit" for a few years that would get soggy and muddy every time it rained. The last couple of years, we've had larger rocks in it that are difficult for an ankle-spraining-klutz like me to traverse regularly. All the while we knew we needed a permanent solution, but funds had to go elsewhere (like when the south side of the house suddenly started sinking in 2008). 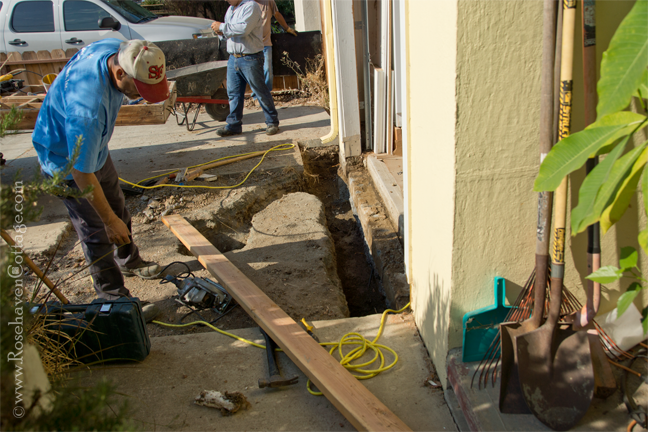 Finally, this last spring we determined (thanks to a healthy income tax return) we could venture to ask for a bid for a permanent drainage solution to be put in by the same skilled company that had saved our house and its foundation a few years ago. We also determined we needed the garage less as a garage (it's too narrow to pull a car into anyway) and more as a studio space for me where I would get the right natural light I need for photography. 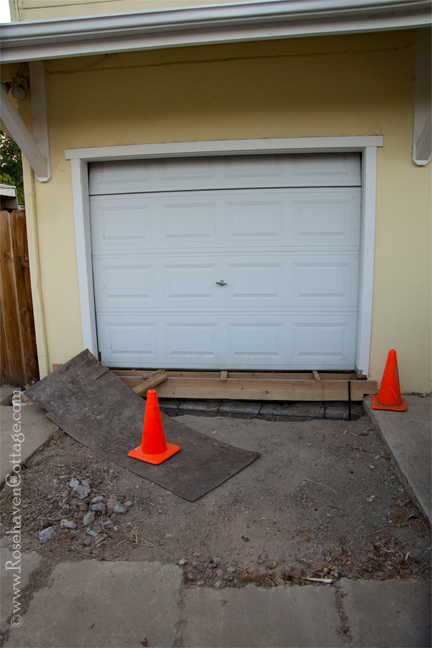 We concluded that if in the process of installing a drain, we also had a foundation footing constructed across the existing garage door opening it would be advantageous for two reasons. First, it would be further protection against flooding, and second, we could install a beautiful set of windows in the existing opening that would mirror the living room windows on the opposite side of the house. The light from the new east-facing windows would make the space ideal for the official headquarters of Rosehaven Cottage Inc. that currently resides in a bedroom with south- and west-facing windows that are not conducive to the work I do. We had the foundation company come out and draw up a bid a few months ago and then had to wait for their very busy docket to free up so they could do our job. They are a reputable company with solid ethics and a phenomenal end-result, so they are in high demand. In the meantime, I was able to get my head around the design of the new studio space; what I would be using it for; and how I was going to accomplish it. Through much prayerful pondering on the subject, I was led to some conclusions about my own career path. My true passions were brought to the forefront of my mind--photography, historical research and preservation; digital restoration of rescued antique and vintage graphics on paper ephemera; creating digital art from photos and rescued images; and teaching. 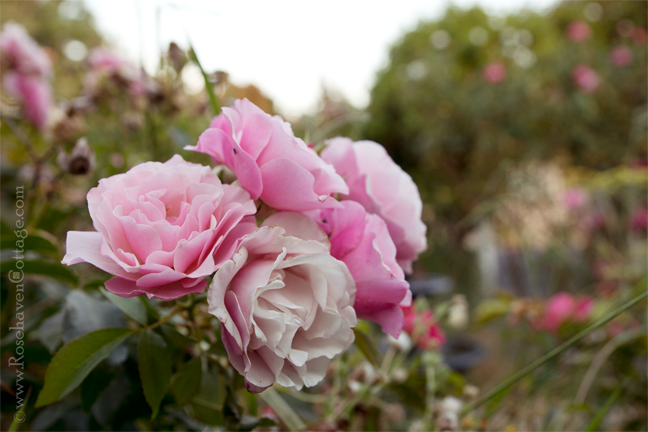 I spruced up www.RosehavenCottageStudio.com (my companion blog that focuses on my creative career). 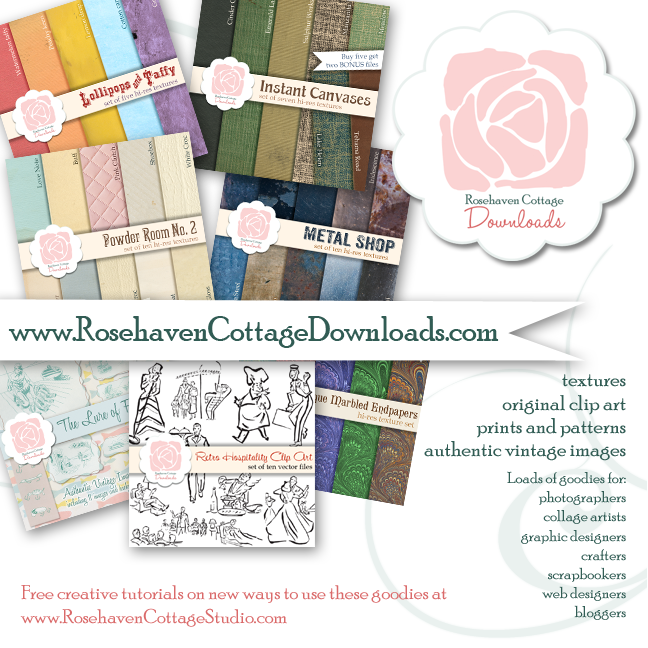 Then I decided to completely overhaul my digital download shop and reopen it as an Etsy store at www.RosehavenCottageDownloads.com with the express purpose of using the proceeds to finance the buildout of my studio space. And I determined that I wanted to do most of the work myself while learning more construction skills and cabinetmaking in the process. So that "new beginning" started for me about a month ago. And I must admit that writing about it here (or anywhere on my personal social media accounts) is a hard thing to do. I have a hard time being a self-promoter, because I'm always concerned that I will offend someone. But I finally realized that my friends probably want to know about the promising horizons I'm exploring. So I'm going against my natural tendencies and being more open about the goals I'm setting for myself. Today (August 19, 2013), first thing in the morning, work began on we have waited so many years to see completed. It makes us emotional if we sit and think about it. We have waited so long for our little home to be truly safe in a rainstorm. And... it... is... finally... happening! 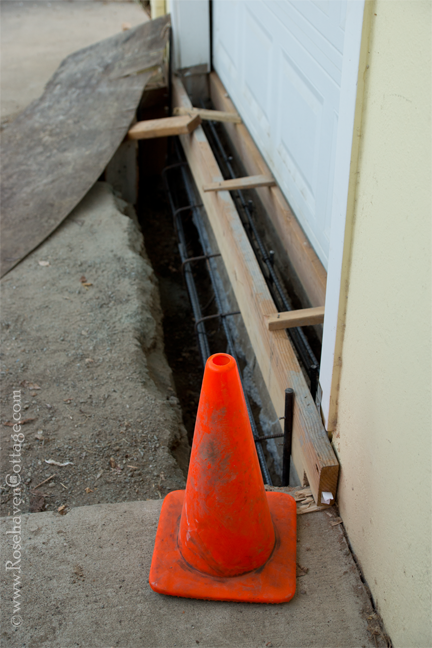 By mid-morning today, trenches had been dug for the foundation footing as well as the drain and drain pipe that would take water away from our house underground to connect to a storm drain box we share with our neighbor who also has to deal with flooding issues. After the end of the workday, I felt it was okay to go out and take more photos. I didn't want to get in their way while they were working so I waited (Hubby took the ones above because he's braver). 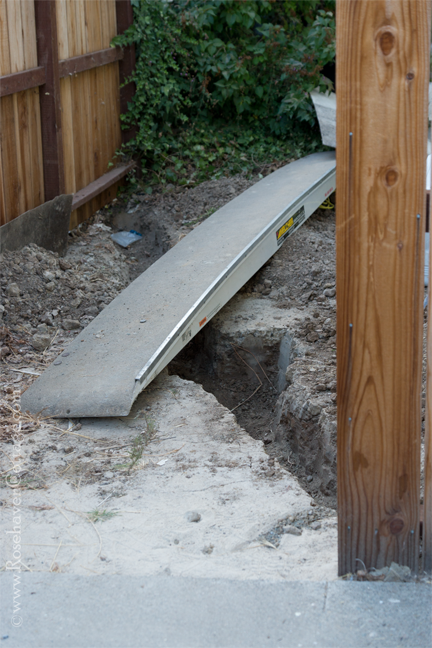 The trench for the drain wraps around the corner of the garage and down our side yard to connect to the subterranean storm drain just on the other side of our fence. 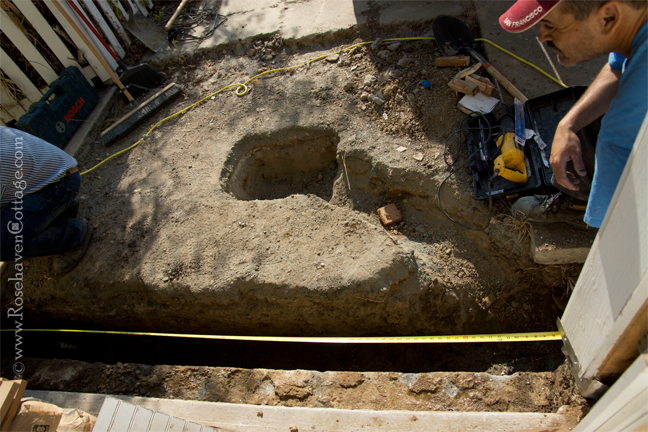 Our neighbors won't have to have anything dug up on their side. All the work can be done on our side. The forms for the foundation footing are all constructed and ready for the concrete pour to happen once the county permit inspector gives them the thumbs up. Another view shows the beautiful rebar work that's been constructed (well... at least we think it's beautiful). Only a few feet away on the other side of the front porch, our highly prolific but completely unplanned 'Sweet 100' tomatoes are unaware of the goings-on. Planted by tomato-eating critters last summer, these volunteers have given us a produce garden this year even though we didn't think we were going to have one because I was out of commission when planting season was upon us with a back injury, then a cold, then a fibromyalgia flare-up, then another back injury. 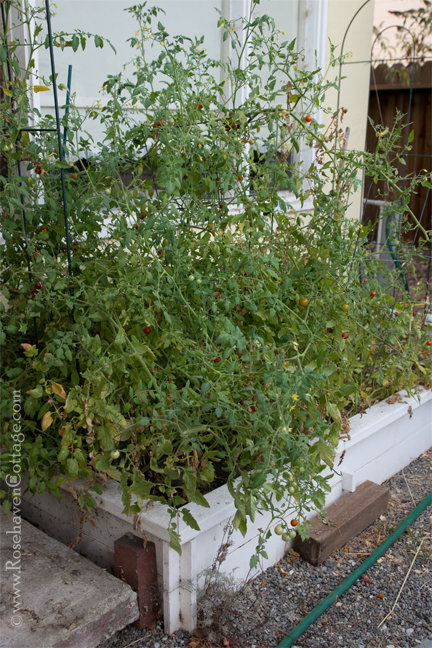 By the time I was actually functional, the volunteer tomatoes were already producing sweet, ripe, red fruit. Once again, our needs are being met. We are being watched out for and blessed with what we need, when we need it. I couldn't ask for more than that. How exciting for you guys! Glad you are getting this much-needed work done on your home. And how cool to have your newly designed studio. Congrats! What a wonderful milestone to finally get too. I just told Stuart about your stop-gap drainage solution for his rental. I'm so glad you are not only fixing the flood danger problem BUT getting a new studio! Once again, your life and mine are traveling in parallel directions! This is so exciting!! Take a deep breath, swallow hard, and get past what you perceive as self promotion. We WANT to hear about your space, every single you-may-think-it's-boring detail, as it happens. Think of it as a teaching opportunity. You're not boasting, you're sharing ... and I want to see and hear ALL about it. Well, I don't envy you having to live through yet another construction project, but I'm excited for you and your new endeavour. By the way, I feel the same way about self-promotion. A friend of mine shared something on Facebook the other day that really stuck with me though, and it eventually prompted me to advertise my new Etsy shop, too. It went something like this: "Not advertising is like a man winking to a woman in the dark. He knows what he's doing, but nobody else does."